The editors sought to compile a series of questions that probe the current condition of the conundrum of glaucoma. The answers were provided by invited experts and many of the replies are definitive and based on clinical or laboratory research. Other answers express opinions that are anecdotal and based on experience or logic. And of course some of them raise new questions. This book invites to consult and read. In the end it gives you an answer to the questions you may have. Publication details: Book. 2005. xxvi and 305 pages. Publication date: 2005. 9 tables and 40 figures, of which 24 in full color. Hardbound. 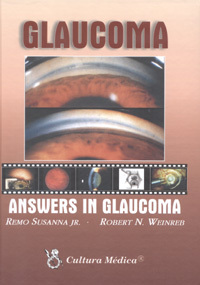 For this book, we sought to compile a series of questions that probe the current condition of the conundrum of glaucoma. Many of the answers that have been provided by the invited experts are definitive and based on clinical or laboratory research that has become possible due to the emergence of new technologies and methodologies. Others express opinions that are anecdotal and based on experience or logic. It was our intent that these questions and the elicited responses would not only provide didactic information about glaucoma, but raise new questions. Some of the new questions might be designed to elucidate existing answers. Others might arise from the surprise of learning something inconsistent with previous expectations or understandings. And still others might arise from either practical need or curiosity. An enhanced understanding of glaucoma depends upon the generation of answers to these new questions, as well as informed alterations of the answers to the existing ones provided here. Question 1 - How is glaucoma defined? Question 2 - Why do people go blind from glaucoma? Question 3 - How often do patients with glaucoma become blind? Question 4 - What causes optic nerve damage in glaucoma? Question 5 - Selective cell death in glaucoma: does it really exist? Question 6 - Is glaucoma only an eye disease? Question 7 - Is Glaucoma an eye disease only? Question 8 - Should glaucoma patients undergo genetic testing? Question 9 - What are the ophthalmoscopic signs of glaucomatous optic neuropathy? Question 11 - Is scanning laser tomography useful in the evaluation of glaucoma? Question 12 - Is scanning laser polarimetry useful in the clinical evaluation of glaucoma? Question 13 - Is frequency doubling technology (FDT) perimetry useful in the clinical evaluation of glaucoma? Question 14 - Is SWAP useful in the clinical evaluation of glaucoma? Question 15 - When should UBM be performed in the evaluation of glaucoma? Question 16 - Are there methods for assessing ocular blood flow in clinical practice that are relevant to glaucoma diagnosis and management? Question 17 - What is the earliest detectable sign of glaucoma? What are the ideal characteristics of a drug for the treatment of primary open angle glaucoma? Question 20 - What is maximal tolerated medical therapy? Question 21 - What is the practical importance of blood flow evaluation in glaucoma? Question 23 - When should we treat ocular hypertensives? Question 24 - What is the practical importance of pachymetry in the clinical evaluation of glaucoma? Question 25 - Are myopic eyes more susceptible to glaucomatous damage? Question 26 - Is sleep apnea a risk factor for glaucoma? Question 27 - What is the importance of IOP fluctuation in glaucoma? Question 29 - Is treatment of early glaucoma important? Question 30 - What is the role of rate of progression in the management of glaucoma? Question 31 - How can one optimally follow patients with end-stage glaucoma and advanced visual field loss? Question 32 - How should normal tension glaucoma be managed? Question 33 - Is laser iridotomy indicated in the management of pigmentary dispersion Syndrome? Question 34 - Why is intraocular pressure difficult to control in exfoliation syndrome? Question 35 - How is neovascular glaucoma most effectively managed? Question 36 - When is an angle occludable? Question 38 - Is primary angle-closure glaucoma a single disease? Question 39 - How is acute angle glaucoma managed? Question 40 - How is a patient with chronic angle closure best managed? Question 41 - How to diagnose and manage glaucoma in nanophthalmic eyes? Question 42 - Which are the limitations of laser iridotomy in the management of primary angle closure glaucoma? Question 43 - How is malignant glaucoma diagnosed and treated? Question 45 - Is there a role for selective laser trabeculoplasty? Question 46- When should a laser iridoplasty be performed? Question 47 - What are the indications for trabeculectomy in the management of the glaucoma patient? Question 48 - When to use prophylactic antibiotics prior to trabeculectomy? Question 49 - When and how is 5-fluorouracil (5-FU) used with trabeculectomy? Question 50 - When and how is mitomicin C used with trabeculectomy? Question 51 - When should we use releasable sutures in trabeculectomies? Question 52 - How should a postoperative bleb leak be managed? Question 53 - When should a choroidal effusion after trabeculectomy be drained? Question 54 - How should hypotony maculopathy due to overfiltration be managed? Question 55 - What are the risk factors for bleb-related endophthalmitis? Question 56 - How is a failing bleb diagnosed and managed? Question 57 - Which patients are at most risk for post-operative vision loss following trabeculectomy? Question 58 - What are the indications for combined procedures (cataract and glaucoma)? Question 60 - When should glaucoma drainage device be used in the surgical treatment of glaucoma? Question 61 - Are mitomycin c or 5-fluorouracil useful with aqueous shunting procedures? Question 62 - What are the main complications of glaucoma implant surgery? Question 63 - What are the indications for laser cyclodestructive procedures?